Home › SEO › Why Doesn’t My Business Website Show Up on iPhone or Android Google Search? Why Doesn’t My Business Website Show Up on iPhone or Android Google Search? Well, the Google mobile algorithm update is upon us, April 21st, 2015 to be exact. While Google has done everything in their power to warn business owners there will still be many that are going to be blindsided by this algorithm update. They will be searching for reasons as to why their website is showing up on desktop search on Chrome, Safari and Internet Explorer yet it is not showing up on their iPhone or Android. 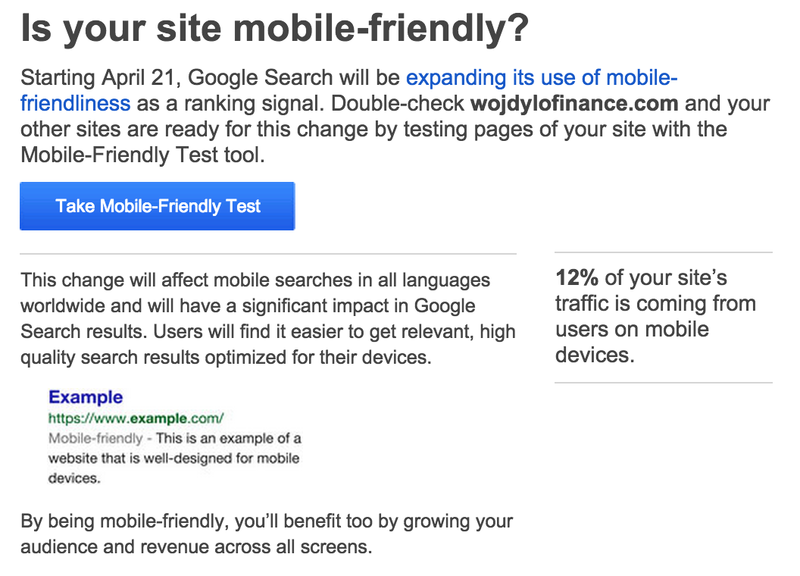 Well, if your website is not mobile friendly it is not going to show up in Google Mobile Search. If you need help updating your website to be mobile friendly please feel free to reach out to me at jwojdylo@gmail.com. If you have Google Adsense installed on your website Google likely has sent you an email telling you how much traffic you get from mobile devices. You can also look this up on Google Analytics. Ultimately, you are getting traffic from mobile search and if your website is not mobile friendly you are going to lose this business in the very near future. I would strongly suggest getting your WordPress website updated before you get hit by an algorithm change. The final weeks of April 2015 are going to be very interesting when it comes to Google Algorithm updates. Some have predicted a Panda or Penguin update will go along with the mobile friendly update. This would cause a huge stir in the SEO world as thousands of businesses will be scrambling to get their Internet traffic back. I personally think many business owners are going to have to make changes quickly because they are stuck using ancient content management systems and web hosting. While I love WordPress I think there are a few options available for lawyers, doctors, financial planners, insurance agents, real estate agents, orthodontists and dentists. Do not feel as if you must use a company that is specific for your industry. I have worked with several clients that have utilized a basic WordPress theme to build out a gorgeous website that generates hundreds of searches a day. In fact, this website is a basic WordPress theme and it generates over 5,000 searches per day. Do not think you need all the bells and whistles to rank in Google search. What you will need is a responsive design that is mobile friendly if you hope to rank in Google search on an iPhone or Android smartphone. If you have any concerns about your website ranking in desktop or mobile search do not hesitate to reach out to me today. I have several monthly SEO packages that can help your business get more revenue from Internet searchers. Quality content, natural links and proper optimization can go a very long way when it comes to ranking on the front page of Google search. Over the next few weeks I am going to be working hard to make certain that all of my clients’ web entities and my web entities are optimized to outrank their competition in Google search. Ranking #1, #2 or #3 can be the different in getting ten phone calls a day and getting zero in an entire month. Remember to create quality, unique content and everything will fall into place.